This is in e-book format ONLY. You may click above and purchase and download straight from Amazon. Author, NONNIE Jules, is sharing her straight-forward, shoot-from-the-hip approach of saying what you mean, and meaning what you say. She has taken some of her most controversial and amusing blog posts and put them together in this one book for your reading pleasure. Enjoy! 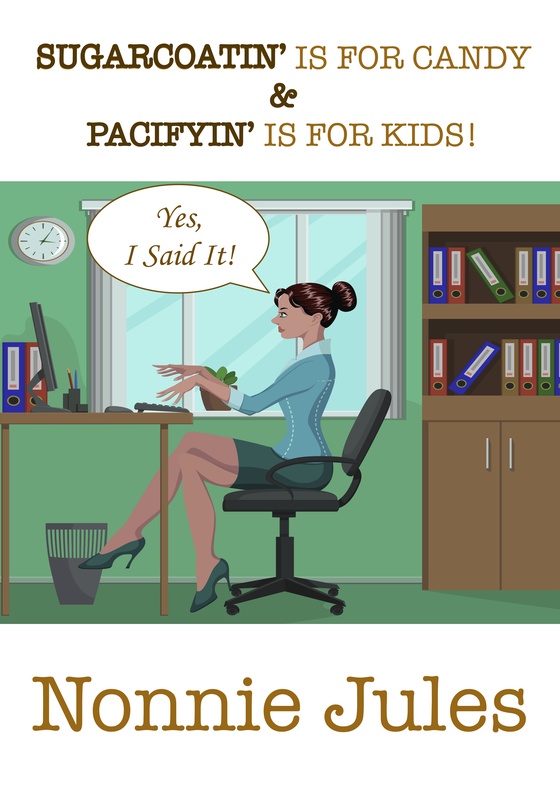 “While I was reading Nonnie Jules’ “Sugarcoatin’ is for Candy and Pacifyin’ is For Kids”, I felt like a child being schooled. And boy was I schooled good. The funny thing is I am not guilty of the Twitter (or social media) transgressions mentioned in the book. If anything, I am the poster child of good Twitter manners and right conduct. Then why do I feel guilty of breaking some unspoken rules of social media usage? Because it’s brutally honest and I was just being sympathetic to those at the receiving end. They should be cowering by now. “This book is a collection of the best posts from Nonnie’s blog. Nonnie tells it as it is, straight talking mixed with inspirational quotes and good advice. She talks about creating a nation full of happy loving people and she is inspired by some great people from her life. I read this right on the back of a book that was all about creating a better world for our children by turning our world from one of fear to one of hope. I couldn’t believe the serendipity feeling that occurred when I read some of the points in Nonnie’s book. Nonnie even names Pope Francis who had a very closely related character in the book. Back to Nonnie’s book she has a wonderful quote “A tiny spark ignites a flame, just as a helping hand can do the same.” Nonnie helps others and enjoys doing a good job. She gives plenty of advice to writers and authors about how they can promote their work and she talks about another book she’s written The Good Mommies’ Guide to raising (Almost) Perfect Daughters. Great book full of important information. Don’t forget to check out her other amazing books: Daydream’s Daughter, Nightmare’s Friend and The Good Mommies’ Guide to Raising (Almost) Perfect Daughters.